Arctic Fire wins a thrilling Randox County Handicap Hurdle for Willie Mullins! Paul Townend produced the Willie Mullins-trained Arctic Fire to perfection to claim the spoils. Mullins, registering his fifth victory of the week and 53rd victory at The Festival overall, was delighted with the eight-year-old who has been off the track for 13 months and had to carry top-weight in the two-mile event. Under Townend, the son of Soldier Hollow made strong headway on the stands' side rail in the home straight to get the better of Nicky Henderson's L'Ami Serge by a neck, with a further neck back to Philip Hobbs' Ozzie The Oscar. Air Horse One, trained by Harry Fry, was two lengths back in fourth. Mullins also saddled the 2015 winner of this event, Wicklow Brave, who was ridden by Townend and also owned by Wicklow Bloodstock Ltd. He now joins Gordon Elliott at the top of the Irish Independent Leading Trainer Award for this year's Festival. The Closutton handler said: "I fancied Reneti [eighth] for this who worked very well at home and I thought Arctic Fire could be a social runner rather than a fancied one. "He is a class horse on his day and the handicapper probably, even though he was carrying top-weight, his rating was maybe 6lb below his top rating and that gave him a fighting chance. "He pulled so hard on the way down to the start and Paul dropped him right in and then they went a huge gallop so the horse's which were able to close fast had an advantage and lucky enough, he had a clear passage on the inside. It's fantastic for Paul and great for the horse too. "Carrying top-weight in handicaps is very hard but he does have a bit of class and if he did go back to his previous form, the handicapper had given him a chance." Mullins also had news on Betway Queen Mother Champion Chase seventh Douvan, who was found to be stiff behind after the race. He said: "Douvan has a stress fracture on his left ilium. Box rest and he should be 100%. The vets are recommending 12 weeks but I imagine we will see. "That is very good news. With bone injuries, horses usually come back 100% and they heal well." Arctic Fire gave jockey Paul Townend a fifth career win at The Festival when taking the Randox Health County Handicap Hurdle by a neck from L'Ami Serge in a photo-finish. The 20/1 shot and top-weight is trained by Willie Mullins, for whom it was a fifth success of the week. Mullins has now joined Gordon Elliott at the top of the Irish Independent Leading Trainer at The Festival Award. Arctic Fire was second in this race in 2014 and second in the 2015 Stan James Champion Hurdle, but has been off the track since January 2016. Townend said: "It is some training performance by Willie to get Arctic Fire back after such a long absence. "He had top-weight in the race but he had it for a reason. He is a class horse. I went out with the mind-set of riding him like the best horse and thankfully it has paid off. "They went a good gallop all the way, as we expected. The leader got away. It is very hard to do that around here because you can't gain that much of a lead without doing a hell of a lot. That horse has a run a cracker, but I had no choice at that stage after deciding to drop in. "To carry all that weight on the back of a big absence was some effort." 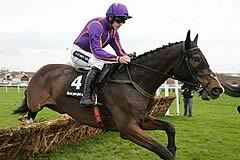 Townend won the Randox Health County Handicap Hurdle two years ago in the same colours - those of Wicklow Bloodstock (Ireland) Ltd - on Wicklow Brave. L'Ami Serge, a 25/1 chance, finished a neck second to Arctic Fire. He has been running in Graded races, but has found either one or two too good in a run of seven races, including the Grade One Manifesto Chase at Aintree, beaten eight lengths by Arzal, April 2016, and the Grade Two Relkeel Hurdle, a head second to Agrapart, at Cheltenham, in January this year. Nicky Henderson, the King's Theatre gelding's trainer, commented: "Things haven't really gone his way this season but he has run a great race. He has finished his race well today. He hasn't been finishing things off as well as he ought to be." The seven-year-old has no current entries but Ayr might be a possibility Henderson added: "I thought Ayr might suit him and the Scottish Champion Hurdle (April 22). It would be a good race for him." The Philip Hobbs team were all smiles after Ozzie The Oscar's third at 50/1, beaten just two necks. "We are so pleased with that, especially as he only just got into the race!" said Sarah Hobbs, wife of trainer Philip. "The owners, the Bradley Partnership, are thrilled, they have never had a placed horse at The Festival before and Ozzie has picked up over £8,500 for his efforts. The only thing is that he is entered at Taunton on Monday and Philip is now saying he wouldn't have got beat if we had waited to go and run there!" Jockey Tom Brien said: "We had a lovely run up the rail, he has run really well, performed above himself."